Taxonomy: Fire Shrimp belongs to the Kingdom Animalia, Phylum Arthropoda, Class Crustacea, Order Decapoda, Family Hippolytidae, Genus Lysmata and Species debelius. Scientific names: The scientific name of Fire Shrimp is Lysmata debelius. 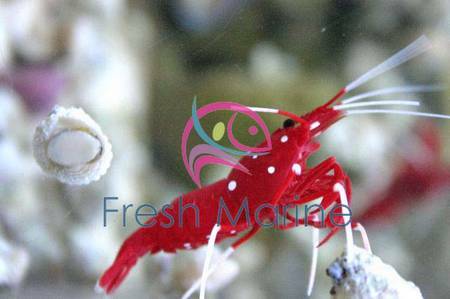 Other common names: Fire Shrimp is also commonly known as Blood Red Fire Shrimp, Blood Shrimp, Cardinal and Scarlet Cleaner Shrimp. Origin or natural range: Lysmata debelius originates in the Indo-Pacific region including Bali and Sri Lanka. Size: Fire Shrimp may grow up to a length of around two inches or five centimeters. Color: Lysmata debelius occurs in bright red and white colors. Lysmata debelius is very hardy. Fire Shrimp is withdrawn in nature and remains hidden behind rocks or in rock caves. Lysmata debelius may occasionally clean the body of fish off parasites, plankton and detritus at its cleaning station. Fire Shrimp is very beautiful to look at. The carapace of Lysmata debelius is bright red in color and is spotted with white. The antennae of Fire Shrimp are quite long and are white in color. Lysmata debelius is hermaphrodite and therefore any Fire Shrimp can mate with each other. Female Lysmata debelius carries light green colored eggs in the finlets below carapace. Illumination: Fire Shrimp requires low illumination in the marine aquarium it inhabits. Habit & habitat: To host Lysmata debelius, you should have a reef type marine aquarium with a minimum water capacity of seven Gallons. Place rock caves, rock crevices, holed Live Rocks and overhangs so that Fire Shrimp can hide out in them whenever it wants to and during molting. Feeding & Nutrition: Lysmata debelius is an Omnivorous and a scavenger in its feeding habit and eats the meaty bits of brine shrimp, mysis and squid, zooplankton and phytoplankton. Fire Shrimp can also be hand fed directly with frozen meaty bits and vegetable flakes. Breeding: Lysmata debelius may breed in a marine aquarium and its larvae may survive, provided there is ample food for other members. Benefits: Due to its Omnivorous feeding habit, Fire Shrimp feeds upon parasites, thereby keeping marine aquarium members free of any parasitic infection. Lysmata debelius cleans your aquarium off of detritus as the shrimp is a scavenger also. Lysmata debelius is easy to maintain owing to its non-poisonous nature and is well suited for moderately experienced aquarists. Copper and Nitrates in your marine aquarium may prove lethal to Fire Shrimp therein. Add Iodine to the aquarium water as dietary supplement for Lysmata debelius to enable a smooth molting process. Do not keep Fire Shrimp with predator fish such as, Trigger Fish, Hawk Fish, Squirrels, Lionfish, Groupers and Eels to name some. Gradually acclimate Lysmata debelius to your marine aquarium to prevent any pH or specific gravity shock to it. Fire Shrimp may kill Cleaner Shrimps and may even be aggressive towards Hermit Crabs in your marine aquarium. Lysmata debelius may disturb Chili Coral in your marine aquarium causing it to close temporarily.